On November 9th, 2017, the SILC Club led a panel discussion on the topic of Reputation and Sustainability, hosted by Latham & Watkins LLP and in collaboration with Mintz Group, a global corporate investigations firm. 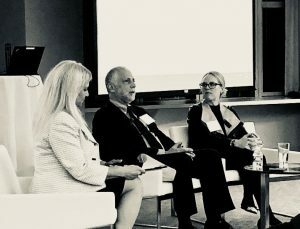 The panel featured Jim Mintz, private investigator and founder of Mintz Group, and Sara Orr, an environmental, energy, and natural resource attorney at Latham & Watkins LLP. The panel was moderated by SILC’s own Deborah Goldstein, founder of DRIVEN Professionals, an organization that advises companies on topics related to human capital. Sara Orr shared stories from her experiences working on environmental, energy, and natural resource-related projects, both in the US and Australia, and emphasized the importance of fully understanding the reputation of your local partner and the overall environment in which they do business when doing deals internationally. Jim Mintz spoke about the tools private investigation firms use to vet both business counterparties and new hires and the ability to customize a search to achieve the right balance of thoroughness and cost efficiency. Audience members raised thought-provoking questions about the reputational risk of not performing sufficient due diligence and the cost-benefit analysis of sometimes pricey background checks. Please join us for our next event on Wednesday, February 7th at Thomson Reuters, where we will discuss stranded assets, climate change, and corporate disclosure. Register here!